The name of the association you belong to is sometimes even more important than your professional successes or academic decorations. Among the sources of social status, sociologists include wealth, "lineage", education, club and "association membership", occupation, and authority. When communities describe how they rank people they know and where they place themselves socially, they talk not only of income plus education and occupation. They bring more things to be prominent: appreciably moral standards, family history, community participation, social skills, and so forth. The mutual support in business and society which usually characterizes the association life is only opened on a highly selective basis. Membership in the right association assumes great social importance in order to maintain their character and identity. The Association is generally interested in new members who are able to socially, spiritually and financially enrich the whole. The Caputo Historical Families Association is in contact with a wide variety of not-for-profit and philanthropic organizations around the globe including but not limited to leading universities, research institutes, academic centers, foundations, cultural institutions, economic development organizations, human service agencies, and advocacy groups, as well as with the governmental authorities of several countries. The object of the association is to promote and support street children, juveniles and elderly people in Guatemala City. The revenues are used exclusively to carry out and to support projects and initiatives in accordance with the criteria defined in the by-laws. The members of the board, as well as the members of the association work for the association on an honorary basis. As the association does not hire any staff, there are no personnel costs. Except costs of printing, material for Diplomas or Certificates as well costs of shipping, costs of medals awards and some other administration costs (outside accounting, book keeping, lawyers and or, when necessary, auditors and cost of web maintenance). Members help facilitate and support the assistance projects of the Association by paying their membership fees and by possibly making additional donations. Some members fully participate in the work of the association and support the association not only with their membership fees but by cooperating actively and on an honorary basis. 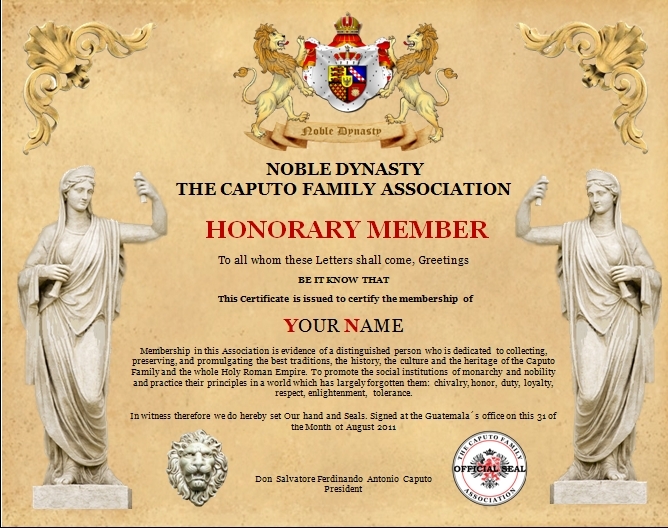 Major support capital for our worldwide works are raised through our financial benefactors, we return this kindness by conferring a "Laurus Nobilis Award" of The Caputo Historical Families Association. Our Council may recommend to our Association, people who have performed great service in support and shares our philanthropic works. The phrase "with privilege there come obligations,? means that being honored is not to be taken lightly. Not much has been handed down to the younger generation about chivalry and courtesy over the past decades! Members are bound by oath to a lifetime of commitment to the betterment of all including ethics, and a financial obligation to help those who need it the most. It does not commit to one organization or another, but commits to serious human conditions that seem neglected, and it takes it upon itself to seek a resolution and not just a simple philosophical "understanding" which is very common in our World today. We talk much about what should be done, but getting it actually done may take forever, or simply remains a philosophy that sounds really good. IF YOU HAVE AN INTEREST IN SUPPORTING THE ORGANIZATION YOU SHOULD CONSIDER JOINING THE ASSOCIATION TODAY. "For our ancestors, in honor of all those great Princes that Honored Our Family and Noble Blood. 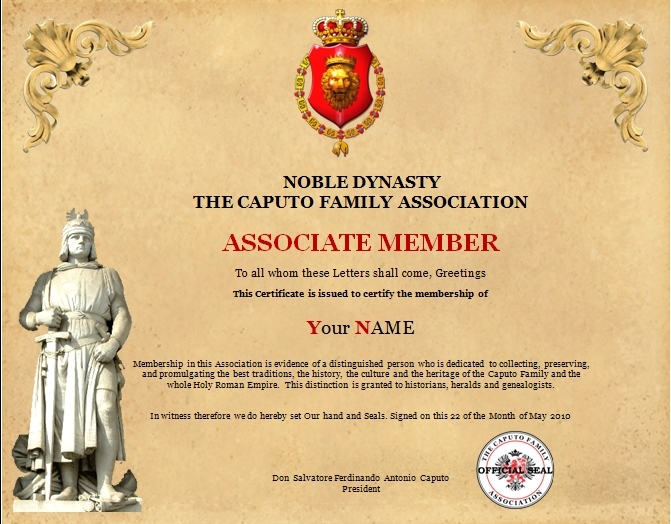 We all have roots in Our Name and Stories; Maintaining a Great Family Tradition and safeguard the heritage bequeathed to us by our ancestors as historic heritage"
Reasons why you should consider becoming a member of The Caputo Historical Families Association. Your personal involvement as a Member will provide opportunities, in charity and fraternity, in the assistance of the street children of Guatemala City and world hungry children; to your communities; and to the less fortunate in our midst. You'll share in the sense of pride all Members feel in knowing that their Organization is second to none in support for our fellow man, especially those most in need; and in binding together to preserve traditional values in the face of attacks against the family and innocent human life. You will promote a cosmopolitan society in which differences will be respected, welcomed and appreciated. Each one of us strives to make a difference in the betterment of all humanity through kindness, care and noble virtues. 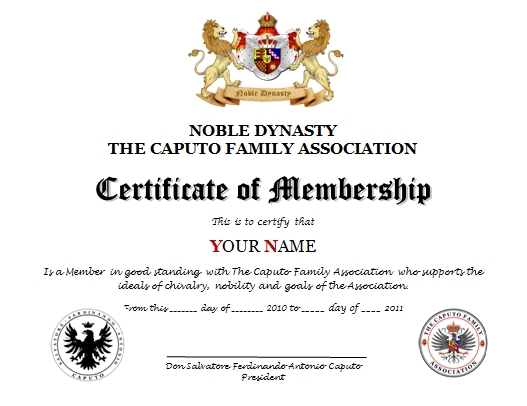 When you have looked at all pages on this website, and thought over what we do, then is the time to contact us and become a member of the Caputo Family Association. 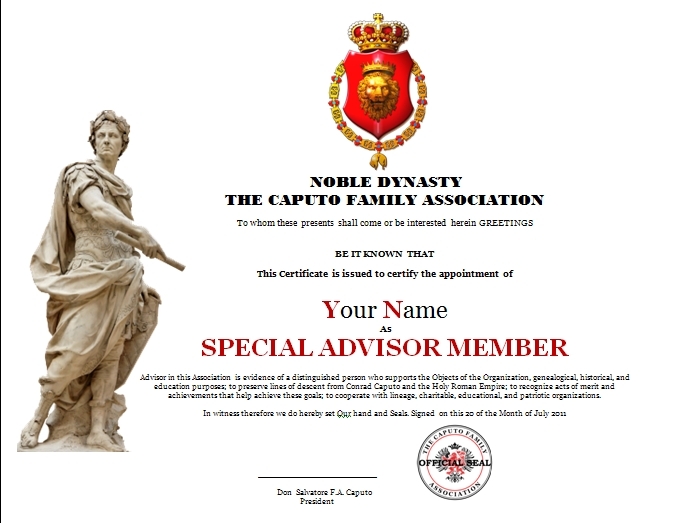 Voting membership is exclusively reserved to individuals whose ancestors were listed in the nobility archives of the former Holy Roman Empire. Full genealogical proof is required through the paternal or maternal bloodline. References to Membership in other societies are not acceptable as proof. 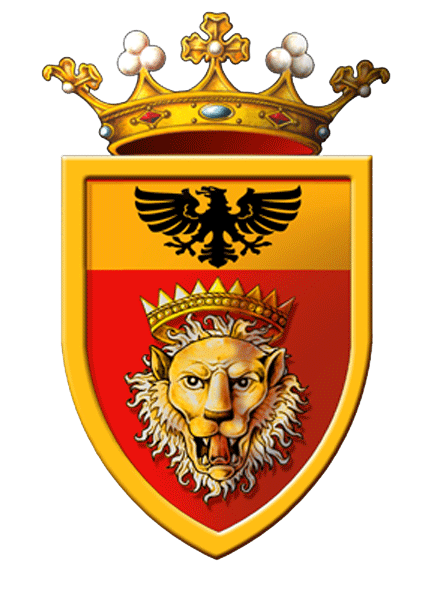 Eligibility for membership consists not simply of proving legitimate Holy Roman Empire descent, but of establishing worthiness of the high distinction this membership confers. Membership is restricted to individual, age eighteen or over, of good moral character and reputation. Gentlemen/Ladies members enjoy every right, including that of holding office. Nominees for membership are required to present properly prepared and endorsed Lineage Claims showing descendant in full details with citations. All completed Lineage Clams must be attested to and signed. Full Members of the Association shall have the right to elect and to be elected to all bodies and participate in all activities of the Association. Individuals who are not related by descend to the Holy Roman Empire. Any interested individual, such as historians, heralds and genealogists can join the Association as associate members, provided, always, that such candidates are of excellent character and are considered qualified and worthy by the officers of this Association. We strive to find individuals who have a deep interest in genealogy and the preservation of history. We like getting acquainted with prospective applicants. They shall not enjoy the same membership rights as full members. They shall be listed as associate members on the published list of members of the Association. They may receive awards for their work and merits. The Titular Class of the Association is open to worthy individuals who support the ideals of chivalry, nobility and the support of the goals of the Association. Provided, always, that such candidates are of excellent character and are considered qualified and worthy by the officers of this Association. They shall not enjoy the same membership rights as full members. They shall be listed as titular members on the published list of members of the Association. They may receive awards for their work and merits. They shall be proposed by the Board and accepted according to membership regulations. They shall not enjoy the same membership rights as full members. They may receive awards for their work and merits. Honorary members are exempt from fees and oblations. Advisors and Patrons are persons of recognized rank and title who advise and support the goals of the Association. Life membership is available in all classes of the Society. Life membership may be transferred without fee to a designated heir for one generation. Normally, a person wishing to join the Association will contact one of the Jurisdictions of their country of residence. In case where a country or regional delegate is not available in your area, request for an admission application may be made electronically by clicking the address below. The form must be completely executed and include any documentation to support the desired class of entry. Each member is committed to an annual oblation (donation) to the Association. Part of this money goes to our Charity Organization and the rest is retained by the local Jurisdiction concerned and used for administrative and philanthropic purposes. Further donations during the year are entirely a private matter. The Caputo Historical Families Association is a non-profit organization dependent on the financial support of individuals and organizations which support our mission and values. It is our intention and privilege to publicly recognize and honor those individuals who have given significantly to the Association. The Association, a private Entity, retains the right to withhold membership to any person without cause. The Caputo Historical Families Association has a firm policy of never giving reasons should an application be declined. Some common reasons for a rejected application include reliance on dubious honors and titles or questionable academic qualifications. Most of all applications are declined, because of the above. When applying as Full Member, the family history and genealogy must be submitted at the time of application along with a copy of the family Coat of Arms if applicable. Claims cannot be submitted at a later date. All documents required at the time of application must be sent to the main office under which the applicant has applied. The delegate or Association`s officer is responsible to ensure that the applicant is aware of the background of the Organization and its activities, and to see that all documents of applicants are correct before submitting them to the Council. All fees to the Organization must be paid on application; this is to cover all international registration and office fees as well as the annual oblation fee for the current year. Admitting Members and Renewing Membership. No person, member or other, is allowed to send, bestow or grant any Diplomas, Letters of Patent or any Certificates in the name of the Organization. 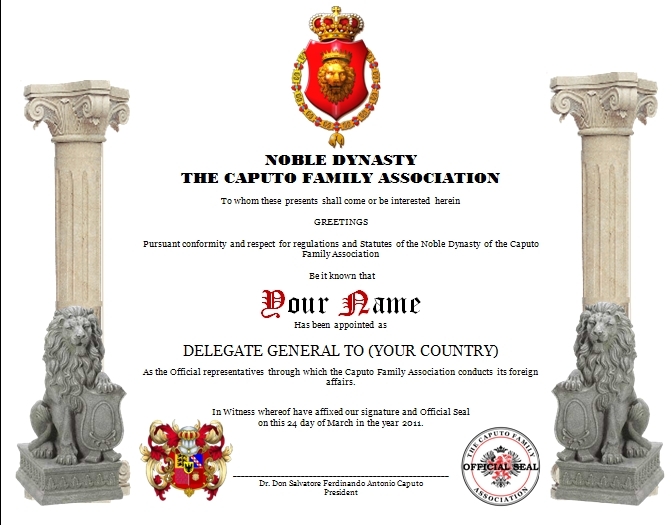 Offices and awards within the organization have to be granted by the President of The Caputo Historical Families Association, with all seals, and signatures. 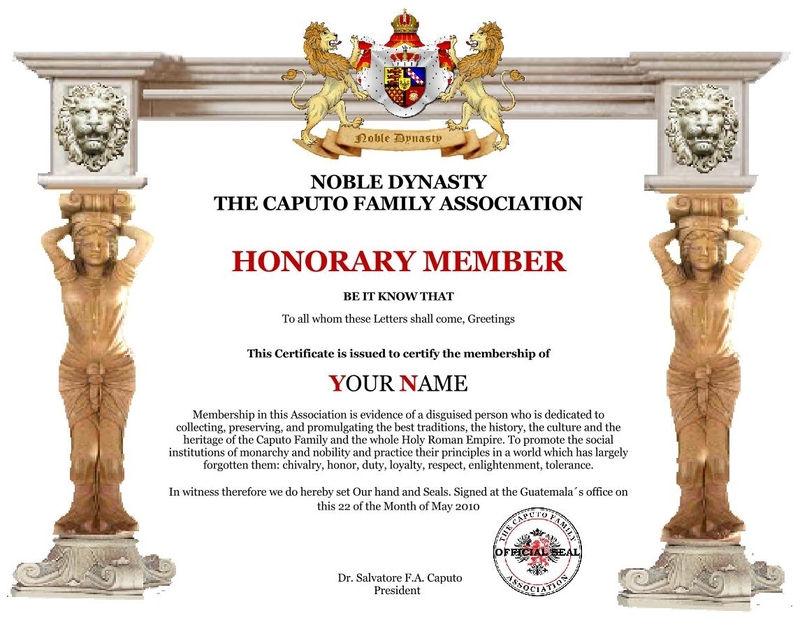 All awards that can be achieved through The Caputo Historical Families Association can only be offered to worthy individuals with a good reputation. We cannot and do not accept every person who is proposed or applies for receiving an award by the Association. The Council will examine the background of each candidate. You will be informed of the procedure to be followed to submit your candidacy or to be proposed for an award of the Caputo Family Association and of the Donations and the processing fees requested. 1. 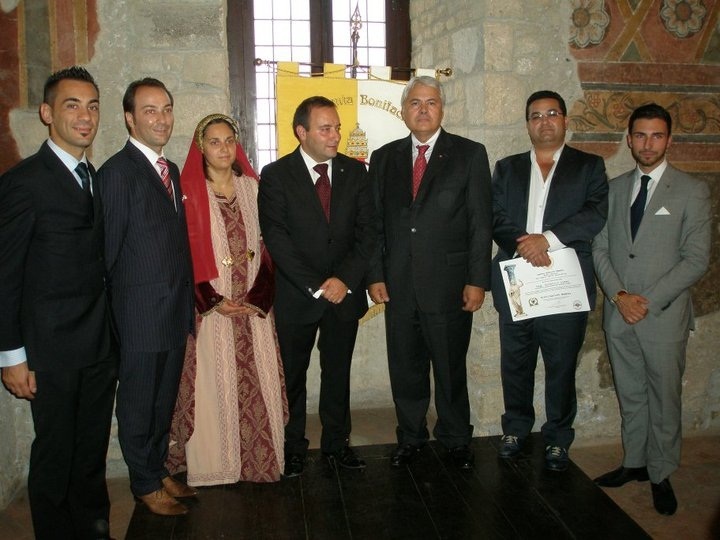 Officers for significant donations of time and funds on the Society´s behalf. Initial fees include: certificate of Membership, Web Listing and first class delivery. 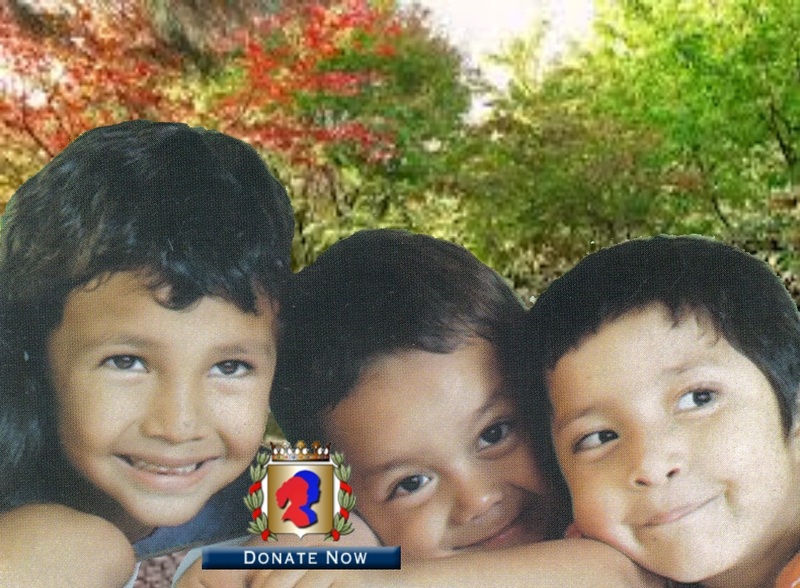 Current members are also invited to contribute to CAPUTO CHILDREN´S FUND. Member in all grades may subscribe to Life Membership in the Association. The fee, at time of application shall be $500.00. Converting to Life Membership after joining shall be $350.00. 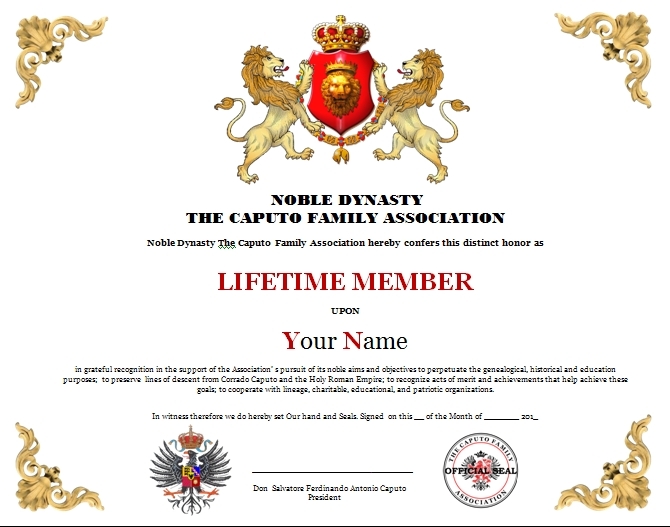 Life members shall take precedence over regular members and shall receive a unique certificate. Life membership may be transferred without fee to a designated heir for one generation. If a member does not designate an heir, their membership shall cease creating a space for a new member. Certificates of Membership. The Council may provide for issuing certificates evidencing membership in the Association. Resignation. Any member may resign from the Caputo Historical Families Association by submitting a written resignation. A member´s resignation does not entitle the member to a refund for any dues, assessments, and other charges paid before the effective date of the resignation and will not relieve him or her of any obligations to pay any dues, assessments, or other charges that had accrued and were unpaid before the effective date of the resignation. Reinstatement. A former member may submit a written request for reinstatement of membership. The Council or officer designated by the Council to handle the matter may reinstate membership on any reasonable terms that the Council deems appropriate. Transferring Membership. 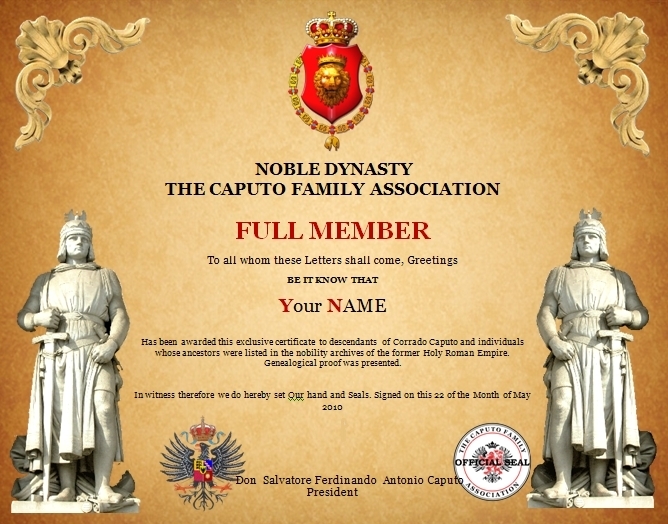 Membership in The Caputo Historical Families Association is not transferable or assignable. Membership terminates when the Society dissolves or a member pass away. Membership is not a property right that may be transferred after a member dies. However, Member in all grades may subscribe to Life Membership in the Association. Life membership may be transferred without fee to a designated heir for one generation. 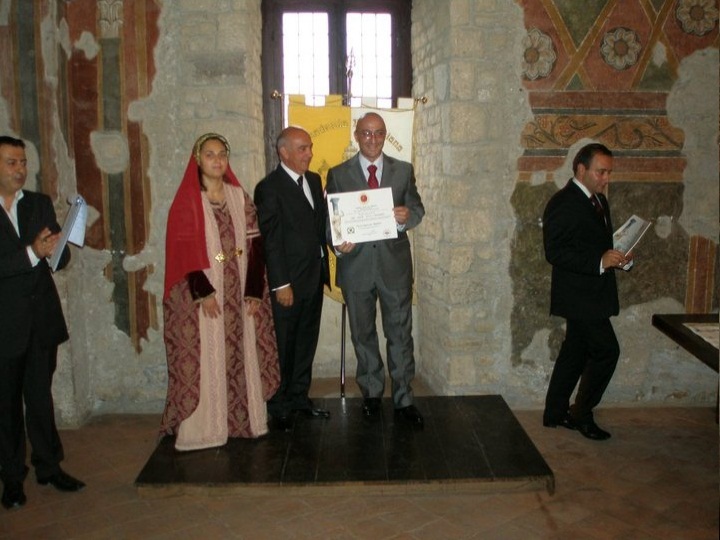 Country Delegates are the Highest-ranking non-diplomatic representatives through which The Caputo Historical Families Association conducts their foreign affairs to stay in contact with organizations, projects and members worldwide and to have reliable local contact, the President of the Association appoints personalities in various countries or regions representing the Association as "Country Delegate". The Council of the Association can create as many Country or Regional Delegates as deemed desirable, both in different states of a country, as in main regions ad cities of those countries which is considered necessary. Charity and faith are essential characteristics of the Association. Membership implies a duty to meditate with particular care on the love of one?s neighbor, the sick, the poor, emigrants, refugees, and all those denied their basic human rights. Members should profess, with all possible charity and humility the sentiments of noble and chivalrous generosity. They should serve as an example to their friends, families and community. Delegates may be Full Members or Associate Members in good standing that are above the age of 21. 1. Remain "in character," faithfully representing the positions and consistently advocating the interests of the nation which they are assigned. 2. Seek the widest possible collaboration where possible with fellow delegates in order to resolve major global problems. 3. Be serious about their work during the entire simulation and conduct themselves in a professional manner in committee sessions. There are passage fees for this important office in The Caputo Historical Families Association. The fees are to cover cost of Certificate, shipping and administration cost. 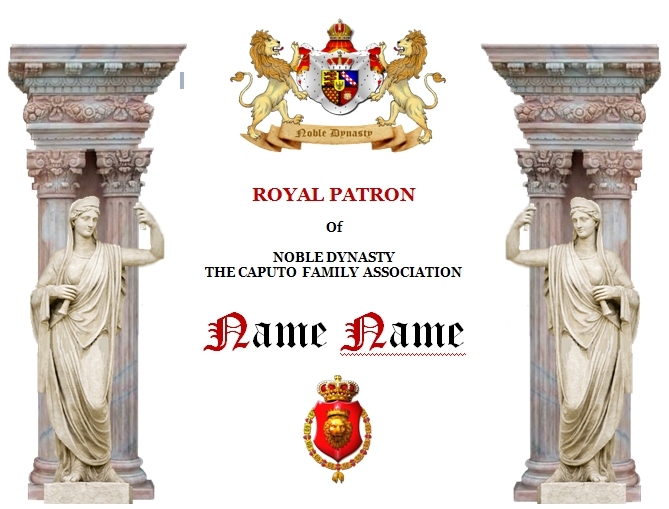 Every person applying for admission into The Caputo Historical Families Association shall be of sound mind and of such means and position as will enable her or him to live honorably and to observe fully and freely the laws and decrees of the Organization. A number of obligations are demanded of members when admitted to the Association: All Members have to observe the Constitution and other by-laws of the Association and to obey the officers. Each member is asked to participate actively, according to ability, in the works of the Association. ALL CANDIDATES MUST SUBMIT A COMPLETED APPLICATION FORM, GENEALOGICAL PROOF WHEN APPLYING FOR FULL MEMBERSHIP AND FEES AS SET BY THE ASSOCIATION. In relation to Membership into the Caputo Historical Families Association, the Council will review but accept petitioner?s claims in good faith but at the same time reserve the right to inquire further into the validity of such claims should we deem it necessary. We simply ask that they all uphold the virtues of honesty and integrity in these matters. 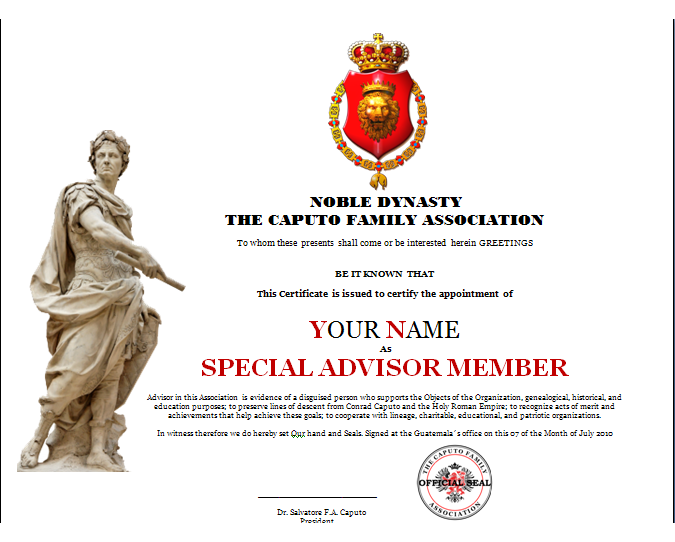 Our membership standards are purposely high, but for those who qualify, the Caputo Historical Familiy Association offers a World Class Society with an international network of some of the most sophisticated and influential professional men and women from many different nations. You need to open a free account and fund your account with your total amount you are donating or paying membership. Your account can be ready in just a few minutes. You can donate/pay Membership via credit/debit card or domestic bank transfer in 30+ countries. Please go online AlertPay, click the Send Money tab, enter this recipient e-mail: noble.dynasty@gmail.com Enter the amount you wish to donate. Your credit card details are not collected or stored on this server, using the highest industry standard SSL security protocol. In order to help us continue to improve our service and upgrade our systems we appreciate any financial support you can provide. We are grateful for any amount of support no matter how small and any donations we receive will only go to pay for our infrastructure costs. Any amount of donations we receive over our infrastructure costs will be given to charity. You kindness and generosity are greatly appreciated. Thank you for your support the goals of the Association.